For etching, feric chloride can be used but it's nasty stuff. Here we can buy hydrochloric acid and hydrogen peroxide off the shelf. The peroxide is added to the acid and as the etching slows down add more peroxide. This gives more info. Look for acid cupric chloride. Another change of plan - I decided that a 4 x 3 layout would be too big and awkward (it really is a very small cottage), so Alnham will have to wait. Longframlington is a former mining village between Morpeth and Alnwick. It never had a railway (coal was moved out by aerial ropeway to Whittle Colliery) but it might have done. So another branch terminus of the kind I said I was fed up with, 6 x 1 overall, Finetrax, two sidings and a run round loop. Nothing very exciting but it will give me something to do in the evenings. 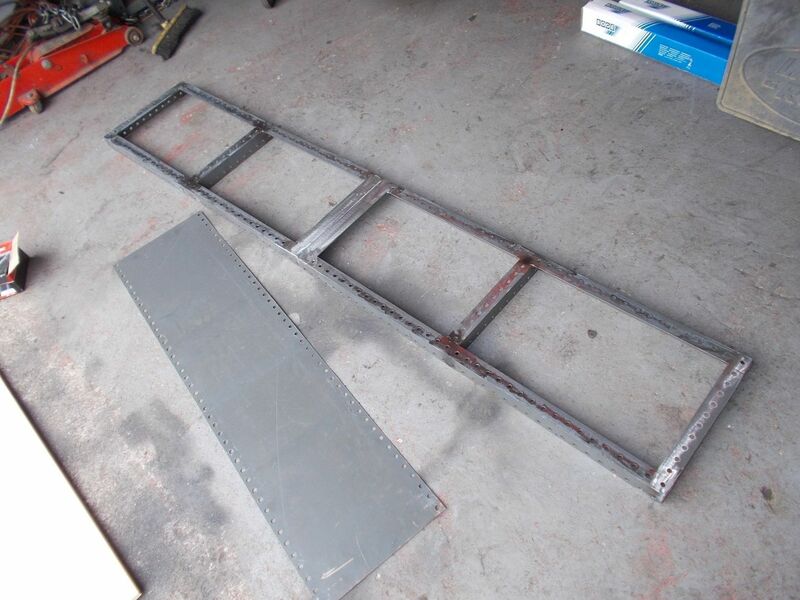 Two 3 x 1 frames made from Dexion, with plain angle steel at the join, MIG welded all round and joined with close-fitting M8 bolts for accurate alignment. The first frame didn't come out as heavy as I feared, so I made a second one. All done on the workshop floor in a bit of a hurry at the end of a long and tiring week, and my set square had gone missing, so they aren't as neat as they should be, but I can't see them falling to bits any time soon. MDF tops bonded to the frames with Tigerseal, and weighed down with various items from the scrap pile (mostly brake drums). The ends of the boards have aluminium angle bonded to them for protection. I'll give them 24 hours for the Tigerseal to cure and then see how they come out. For the moment these will sit nicely on the dining table with some rubber strip on the lower edges (cut up old car door seals will do the job) but I'll have to build some trestles at some point. Traditionalists will be pleased to hear that these will probably be made of wood as I don't have any Dexion long enough. Thanks for the update, Richard. Certainly a novel way to construct a baseboard but I hope that it will work fine for you. I look forward to seeing your new branch terminus develop. I'm sure that it will have a real 'sense of place'. Where will you be fitting the gun turrets? Seriously, though, nice bit of recycling but you may have difficulty in getting track pins in. The Longframlington branch was opened in 1880, built by the North British Railway mainly to serve the collieries at Longframlington and Longhorsley, as well as various stone quarries along the route. From Morpeth the line headed north, climbing steeply towards Longhorsley Moor, passing through the only intermediate station (Longhorsley) then crossing the River Coquet via an impressive fifteen-arch stone viaduct before reaching the terminus at Longframlington. Passenger traffic was never heavy: the Longframlington colliery closed at the end of 1931 and the line struggled on with mainly agricultural traffic. The passenger service finished in September 1952 (the same day as the Wansbeck Valley and Rothbury branches): a twice weekly goods service continued, along with occasional excursion trains, until November 1963 when the line was closed completely (again on the same day that the Rothbury and Woodburn - Reedsmouth lines were closed). Some of the above is true. The rest is plausible. Thank you. I do like a good, plausible back story. Excursion trains are always a good excuse for unusual locos. and coaches and, until the days of Dr. Beeching, BR had the spare locos. (at weekends) and coaching stock (some only used at summer weekends and the Summer timetable, mid-June to early September) to run them. "Garden specials" seem to have been a North East tradition, touring round all the local branch lines stopping at every station so people could get out and admire the station gardens. Seems a strange way to spend a day, and I can't help thinking there must have been beer involved at some point. They continued well into the DMU era. Yes, I forgot to mention that as DMUs became widespread, with less trains running at weekends on local and suburban services and being of a high standard (compared with the ancient excursion stock coaches) and having wide windows, DMUs were used for such excursions. For example, Tyseley's Metro-Cammell DMUs roamed far and wide on Summer Weekends; so I will have a 3-Car one appearing at Cant Cove, in due course (it is awaiting replacement DCC chips being a low priority item). Interesting construction, I defy the MDF to warp with that frame! An inspired back-story. Of course if slightly earlier the advent of the DMU and consequent cost savings may also have put off withdrawal of the regular passenger service until 1963/4 so a plausible reason to keep Longframlington open to passengers? A two-car DMU in BR Green would then be possible, Roy, towing a tail-load van? The problem with DMUs is that they aren't terribly interesting from an operating viewpoint. 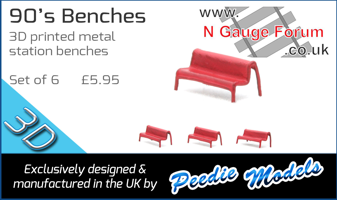 The Farish Metro-Cammell is a nice model though and very typically North Eastern. If I ever get my G5 and / or J21 built I'll probably run two periods - 1951 with steam passenger service, and 1961 with J27, J39, 2MT and maybe a DMU. Motive power for the branch would probably have come from North Blyth shed, and they had some J39s and 2MTs in 1960/61. The stations on the Wanney and Rothbury branches were kept very tidy for many years after the passenger service ended, so Longframlington would have looked much the same in 1961 as it did ten years earlier. Baseboards are now home after a couple of modifications to the joining system - it now has proper bolts (i.e. 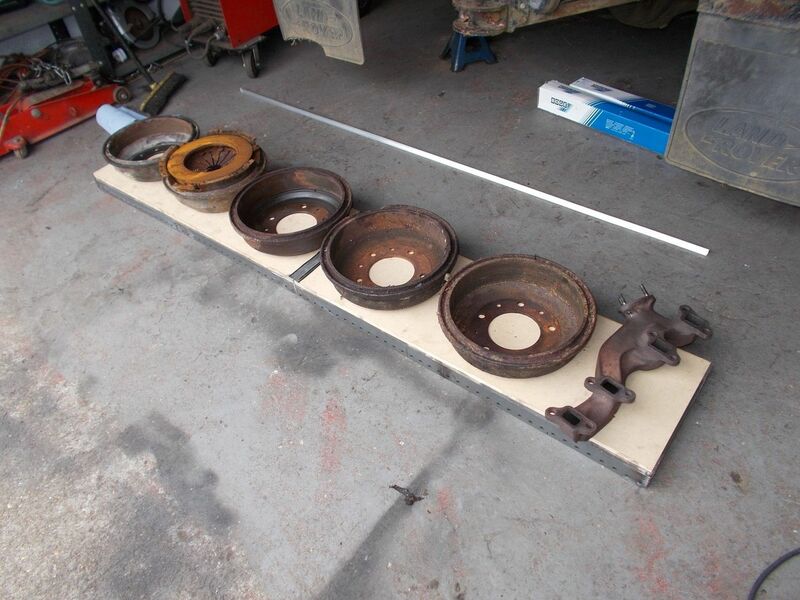 with short plain sections at the head end) welded to the end on one side,which makes for a very positive alignment. 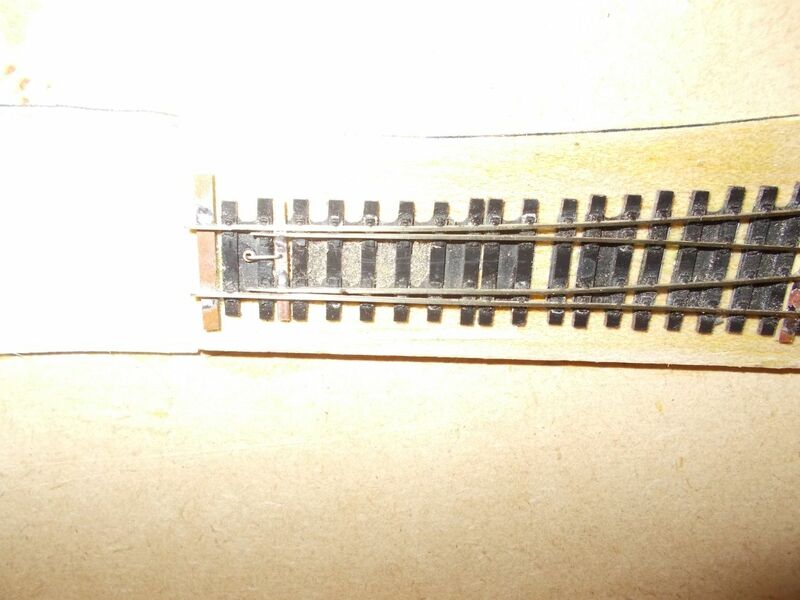 Baseboard joins in N gauge are something I have always found tricky - it only takes about 0.2mm misalignment to get a very noticeable thump as the wheels run over the join. As my track plan has four separate tracks at the join, I need to get that bit right. I still need to get my head round point operation before I can start laying track: I'm planning to use wire-in-tube to keep things simple, but want point operation and frog switching to be done in a single movement, and spring-loaded microswitches will interfere with the over-centre springs that I have fitted to the Finetrax turnouts. I thought about a sliding contact on the tiebar but then realised it would switch the frog the wrong way. The first person to come up with a really nice, reliable, integrated switching mechanism for fine scale N/2mm points is going to make some money out of it. Short blade throw and delicate blades are an awkward combination. I agree with you, Roy, about the Metro-Camm. DMUs. I remember riding on the two-car unit on the Haltwhistle to Alston line back in the late 1960s. I believe Graham Farish are going to reintroduce their Metro-Camm. DMU models, soon. 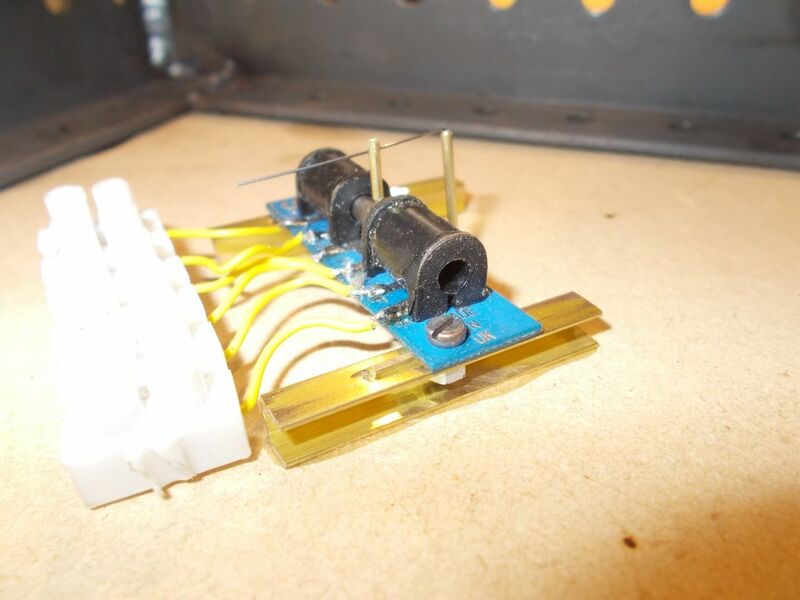 I'm planning to use wire-in-tube to keep things simple, but want point operation and frog switching to be done in a single movement, and spring-loaded microswitches will interfere with the over-centre springs that I have fitted to the Finetrax turnouts. I thought about a sliding contact on the tiebar but then realised it would switch the frog the wrong way. The first person to come up with a really nice, reliable, integrated switching mechanism for fine scale N/2mm points is going to make some money out of it. Short blade throw and delicate blades are an awkward combination. That might in the end be the easiest solution, with Omega loops to compensate for the difference in throw. But I'm now thinking it might be useful to be able to operate the layout from either side - our club show organiser is a very persuasive man. That really means some kind of electric operation, unless I want rods running from side to side like one of those table football things you sometimes see in pubs. I also need to engineer the operating mechanism so that I can replace tiebars, my experience is that they are more likely to fail than anything else. Well, I've made a start. I decided to just lay the fiddle yard turnout and play with point mechanisms before I went further. 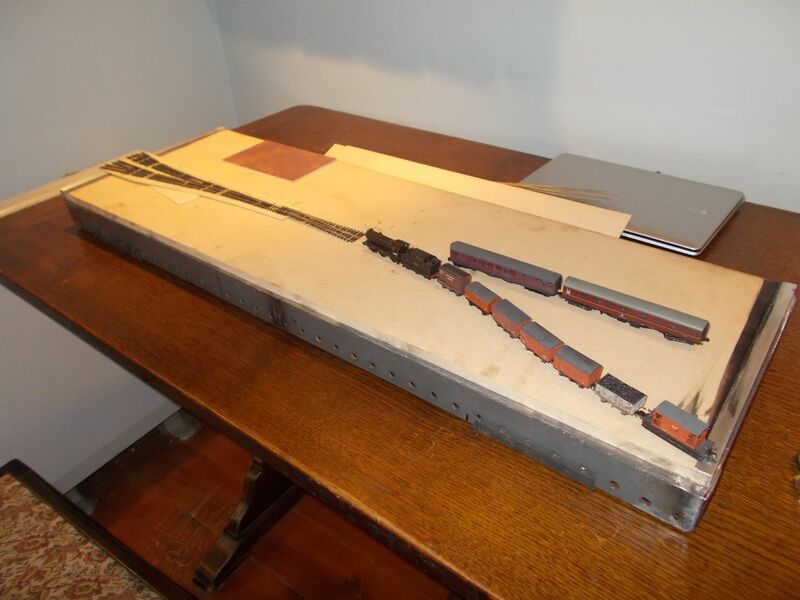 This was the first Finetrax turnout I built: it still has the cast frog and has been much abused in various experiments, so no longer suitable for public viewing. But it seemed a shame to bin it so I strengthened it up with PCB, replaced the tiebar and glued it to a 1/8" balsa base with Evostik. I have had to shuffle the pointwork around a bit compared with my original layout plan - the fiddle yard was going to be too short to be usable, partly because I am now using a B6 turnout rather than the A5 I intended. This photo shows me playing around with stock to see where the pointwork needed to go. Two coaches or six wagons and a brake van is the limit. Well, it is a micro layout after all. After much fiddling I came up with a idea for an adjustable, spring-damped underboard solenoid operating mechanism. Adjustable because with hand-built turnouts every one is slightly different in terms of tiebar friction and throw. Spring-damped to protect the delicate little blades from being hammered to death by the solenoid. It is actually very simple. A cranked arm made from 0.4mm piano wire, operating on the centre of the tiebar, runs down through a brass tube, with a right angled bend at the bottom end. The point motor is mounted on slotted U section brass channel with small nuts and bolts. The pin that normally goes through the baseboard is cut short, and a fork (made from 1.5mm brass tube) glued onto the opposite end of the pin (the short stubby end). The piano wire sits in the fork, and the distance between the motor and pivot can be varied via the slotted adjusters to increase or decrease the force transmitted through the wire crank. It might look Heath Robinson but I've put it through about fifty cycles and it has worked every time. There's enough friction in the motor itself to hold the blades in place without any tendency for the motor to creep back towards the central position. In fact it works so well that after taking the photos I was able to move the motor right out to the end of the slots, leaving the blades so lightly sprung that you could run a loco through them set the wrong way (if the electrics didn't stop you). I don't think this is actually my idea, pretty sure I saw it in a magazine a long time ago. Anyway, seeing as it appears to work I can now get on and lay the pointwork complex at the station throat.